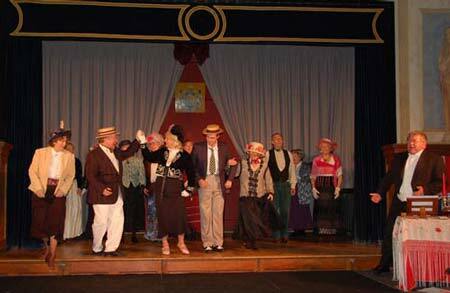 Enthusiasm, entertainment and enjoyment were the hallmarks of the bubbling Old Time Music Hall presented for our delectation by the Victory Players last month. Leading this rowdy extravangza was the ebullient Chairman Rodney Saunders, full of excruciating introductions and innuendos, oozing bonhomie, and egging the audience on to even greater excesses — not that they needed any help. He was clearly in charge (sometimes) of the boisterous proceedings for the evening. The involvement of the audience was an essential ingredient in the show’s success. They joined in the choruses with gusto, shamelessly shouting ribald insults, or ‘oohs, aahs and boos’ when the action merited such vulgarity. A large cast of local artistes were well groomed in their solos and choruses, with the audience lustily singing along to such old-time favourites as ‘Let’s all go down the Strand’ and ‘Love’s old sweet song’. The gorgeous Can Can girls were received with enormous enthusiasm and later rewarded ardent fans with stolen kisses. (I was lucky enough to get two!). There was the inevitable over-acted Victorian melodrama featuring a wicked landlord (boos), drunken guardian (oohs), fair maiden (aahs), and rescuing hero (cheers). Some of the Artistes with Chairman, Mr. Rodney Saunders (right). The evening ended with a bravura performance by Hugh Bottomly in full highland kilt singing ‘The Sergeant Major’s on Parade’, followed by the crowded Victory Hall erupting in a deafening rendition of ‘Rule Britannia’. The costumes were excellently chosen to be in period, and the atmosphere was greatly enhanced by the hail decorations of union jacks and posters of former Music Hall stars. The two piano accompanists, Douglas Wragg (who directed, and also arranged the songs) and David Moore, were outstanding, each responsive to the other and to the music being played. Praise too, to all the production team, and to Robert Saunders for his designs of advertising posters, pictures around the hall, and programmes. The profits of £1,500 (including a £200 donation) were given to ME Research UK. CLICK HERE to launch a gallery with a selection of photos from The Old Time Music Hall. CLICK HERE to view a PDF file of the programme for the Old Time Music Hall, or right click and select "save target as" (712 KB).